Some Christians can be quite cruel and offensive in their twisted theologies. I once had someone tell me "well, with your life in such a state, maybe you're not one of God's elect." That would be a strange conversation. I haven't heard of any prosperity teachers who actually hold to the doctrine of election. Either I'm the recipient of many very strange and wonderful random circumstances that have lead me to where I am today (blessed in numerous ways) despite my own efforts to foul it up, or God lights my way. I have had too many opportunities that have "fallen into my lap" to believe it's of my own doing or pure coincidence. I surely don't deserve what God has provided of my own accord. +1, word for word, especially the last sentence. Yes, He has a purpose for you. - No, that doesn't mean you get to quit trying and then either blame or credit Him for every bad and good thing in your life. We have a few brothers here who blame God for all that's wrong in their lives, ask for prayer that God will change their circumstances, then sit idly waiting for things to just miraculously change. - No, that doesn't mean He necessarily cares what socks you wear today, or what you eat for lunch, or what car you drive, or maybe even what job you choose to take. I think the closer we are with God (via our prayer, meditation, study, and worship) the more clearly we understand His overarching plan for us and all humankind, and the more our hopes and desires line up with His. Then we can stop wondering - as much - whether we're doing His will or not, because we'll know more clearly what His will is and exactly how we are or are not working to that end. The Spirit will guide when the Spirit needs to guide. I hear the phrase often when attending funerals of people I feel blessed to have known. Next time a couple you know miscarries, tell them "It's God's plan" or "I guess God wasn't ready to give you a child". They'll love that, and they'll snap out of their self-centered grieving once you share the good news. A metaphor or illustration that has helped me is that on this side of Glory we have the back side of a tapestry, with all its crazy dangling threads and mismatched colors of unanswered questions. But on the face of the tapestry is a beautiful and meaningful pattern. We really haven't begun to live yet. I think He did have a plan for me many years ago, but I'm sure I pretty well fouled it up. Maybe that's where Romans 8:28 comes in to play? It seems so, and I like to think so, as I look back. The tail does not wag the dog. I don't believe that God has a plan for us as individuals. I see a potter at the wheel who's not paying attention to every fine grain of the clay, but instead the pot. What do you mean by "plan"? 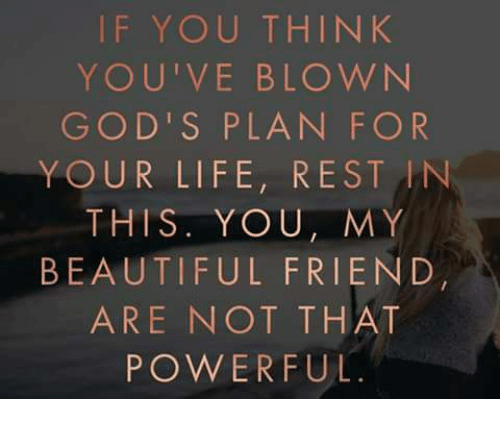 I know you've had someone tell you "God has a plan for your life" at least once at some juncture in life. Me? I've never derived much comfort from hearing it. It always made me feel as though I was not already fulfilling the Plan. It doesn't give me much comfort anymore either. I spent my entire adult life trying to find this supposed purpose/plan with absolute failure. I have searched everywhere I know. So, if God has some specific mysterious plan, He is keeping it to Himself. I just stopped looking. Maybe it will be revealed or maybe there isn't one. I don't know. Either way, I can only devote so much of myself into something which seems unattainable. I stopped playing guessing games a long time ago. What I do know is the world is eating itself and I don't want any part of it. I just want to be in my own little anonymous bubble and, for the most part, left alone. Don't get me wrong, I know right from wrong, good from bad, etc., but I just don't get anything out of the search anymore. I know what I believe, but I don't get anything at all from going to church or spending an absorbent amount of time with other Christians. It all seems a little empty to me these days. Perhaps that will change. In any event, whatever Gods plan is will happen no matter what we do, so I don't worry about it and let it unfold as He decides. Free will for all of its worth, is extremely limited. Sort of like having an ant farm. They can go about and do whatever they want, but only within that farm. Everything else is out of their control and decided for them. Probably a bad example, but that's how I look at things. Wow, now that I read what I wrote, it sounds really depressing. Maybe just ignore me and listen to others who seem to have a lighter grasp on the topic. That is probably what has happened to most of us. We had a real purpose, but messed it all up. The single best thing I have in my life is my wife. I think about that a lot. I don't deserve her. I fail her far too often. She deserves better, but she is mine and I am hers. For some reason God saw fit to put us together and its the best thing to happen to me in an otherwise twisted and meaningless life. I keep this in mind and it keeps me going. Why she loves me, I don't know, but she genuinely does and I am grateful. As bad as things may be, I know they would be a lot worse if not for her. That's the damn truth - three cheers for my wife! That's the question one must ask of anyone who ever tells you "God has a plan for your life." And this thread popped into my head. Of course, when God gave this to Jeremiah, the Israelites were sitting in Babylon with fish hooks in their mouths. As always, there are many things to be learned from the Word. in the same boat, but I do have a son that brings me lots of joy.